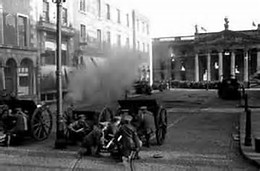 The Easter Rising of 1916, one of the most bloody & politically important insurrections in the history of Eire, very nearly did not take place. Although ill-fated, Irish freedom would most likely, never have been won. April 24 through April 29, 1916 marked the dates of the Easter Rising. Padraig Pearse & his compatriots in the Irish Republican Brotherhood (the IRB) decided Easter Monday would be the time to initiate the Rising. From the steps of the General Post Office (the GPO) the proclamation proclaiming an independent Ireland was read. The plan was to take control of central Dublin, beginning with the magnificent Dublin Post Office, which would serve as headquarters. The British responded immediately. Incorrectly, they believed the Irish would quickly give up. They were surprised at how valiantly & skillfully the Irish rebels fought. Strongholds, manned by only a few rebels, were able to hold their positions for long, bloody periods, taking far more casualties than they suffered. At Mount Street Bridge, the British troops honestly thought they were battling 200 rebels, where there were, in fact, 17. The British forces shelled the GPO, destroying the once beautiful building, killing many civilians in the process. When the GPO was set on fire, Pearse offered an unconditional surrender in the hopes of preventing additional Irish bloodshed. The British showed the rebels no mercy. Beginning on May 3, 1916, & continuing for a week, they executed 15 rebels. Willie Pearse was shot only because he was unlucky enough to be Padraig Pearse’s brother. James Connolly, with gangrenous wounds in his legs from the battle, had to be carried to his executions site, & tied to a chair before being shot.